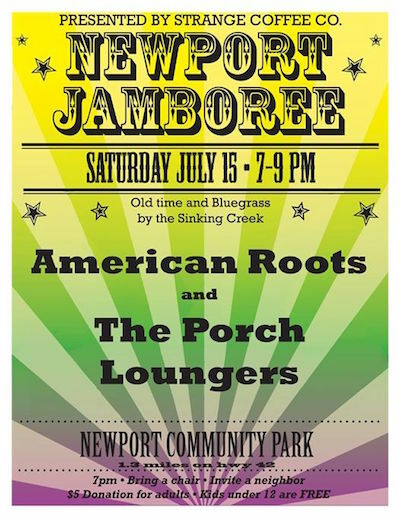 The Newport Jamboree is scheduled one Saturday each month May-September at the Village of Newport Community Park in Newport. The local Ruritan chapter will be selling concessions, be sure to bring a lawn chair. A $5 donation is requested from each adult to cover the bands and park fee - kids under 12 get in free. Rain or shine! Invite your friends and neighbors to swing on by for music by the Sinking Creek. July's music will be American Roots and the Porch Loungers on Saturday July 15 7-9 PM. The Newport Community Park is located on Route 42 in Newport, VA (1.3 miles off Route 460).